I’m not sure whether I am preaching a Sermon tonight or just telling another part of my life story. Maybe it’s a bit of both – but I’ll let you be the judge of that. The two stories in the Readings tonight – the battle between David and Goliath and Jesus and the disciples in the boat on the storm tossed Sea of Galilee – both emotionally conjure up very negative feelings for me – and for different reasons. I loathe physical combat. I deplore fighting and violence. I hate war! There are not many movies I want to watch these days. I can’t cope with rough seas! I can’t cope with any sort of violence or loud noise. There are so many films I can’t watch – Jurassic Park, Silence of the Lambs, Avengers, Star Wars and even Spider Man. And of course in my era (last century) at age 18 we (males) had to do 6 months National Service – in the Army, the Navy or the Air Force – followed by 5 years as an “Army Reservist”. Co-incidentally currently in South Korea all males at age 20 are still required to undertake 1½ years National Service. But as I went to University straight from High School my “National Service” was deferred until I had completed my degree. And “National Service” was abolished in 1959 so I was no longer required to meet my military training obligations after graduation. But I would not have done combat training – I had decided that I would be a “conscientious objector” (even if it meant changing religions and becoming a Quaker) and that I would seek to complete my National Service obligations as a “medic” (stretcher bearer) not as a combatant! Remember “Simpson and His Donkey” in the Grade 4 Reader? That would have been me! In about 1965 I travelled by ferry from Perth across to Rottnest Island to see the Quokkas. Two people on the boat were sea-sick – an 18 month old baby and me! In 1974 I booked a 4 week trip to the Fijian Islands. We sailed most days from one small island to another – and spent the nights ashore to eat and sleep. The four most miserable weeks of my life – I spent the whole day flat on my back – holding my stomach in pain! Two years ago we went to Honolulu to the wedding of two of our friends from Brisbane. The day before the wedding they had organised a trip “to swim with the turtles”. We travelled out to the reef on a catamaran – swam with the turtles – and then before we returned to shore for a smorgasbord luncheon the catamaran headed for the open sea! The waves got bigger! Two people went green. Two people ended up using buckets gleefully handed to us by the delighted crew – one of the grooms and me! Hence my earlier statement – the two stories in the Readings tonight – a fight and a rough boat trip – emotionally conjure up very negative feelings for me. Growing up in the church as a child and a teenager I couldn’t understand why the Old Testament seemed to be all about Israel (and God’s people) being at war with its neighbours. And how the goodies (the Israelites) seemed to always unmercifully trounce their opponents. They seemed to be so ruthless and unkind on occasions – ‘an eye for an eye; a tooth for a tooth’. When I expressed my disquiet to my parents and church leaders I was told that as Christians we sometimes have to fight for what is right – quoting the Crusades as a post Biblical example. And remember that hymn “Onward Christians Soldiers, Marching as to War”? We probably don’t sing it in western churches anymore and today say that the Christian battle does not involve armed warfare – today we see it as a spiritual battle. In tonight’s reading of David versus Goliath – a story by the way which appears in Chapter 2 of the Qur’an – there are many layers and many interpretations of the story. There is the physical challenge – there is the physical combat. There is the physical grandeur of Goliath. Biblical scholars say that his father was a giant and that he had 4 brothers who were also considered to be giants. The Rabbinic Judaic texts infer that Goliath was about 9 feet 7 inches tall – at least 50% taller than most men – and about 400 kilos in weight. Some say that in his armour he could have weighed about half a ton. And his opponent David? We have often been led to believe that David was a scrawny young lad – but according to the reading from Samuel he had killed lions and bears to protect his father’s sheep so he must have had considerable muscle and strength. King Saul had the mistaken idea that Goliath could be defeated by sheer human strength – but David’s speech to Saul pleading for him to be allowed to tackle Goliath acknowledged that it was God – Yahweh – who had given him previous victories and that God would help him in the contest with Goliath. David had faith and trust in God. Often too we have been led to believe that David’s weapon – a sling-shot and 5 stones – was a simple or feeble item! Not true! It was a deadly weapon – the stone would have been travelling at about 60 km per hour and was fatal when it struck Goliath’s forehead. And there has been the suggestion that Goliath suffered from a medical condition called acromeguly which is/was common in people who grow extremely tall. They can have double-vision and severe near sightedness – and of course in those days there were no such things as spectacles let alone bi-focals or multi-focal lens. Goliath represents paganism. David is the champion of the God of Israel, pre-figuring Jesus’ victory over sin and the church’s victory over Satan. In the Gospel reading we heard the well known story of Jesus calming the storm tossed Sea of Galilee. Jesus – exhausted after a day of teaching, preaching and healing – napped. Some of the disciples on board were professional fishermen so these seasoned fishermen would have been used to storms as the Sea of Galilee is renowned for its spontaneous raging storms – but this one must have been a real doozy to make them fear for their lives. The terrified disciples woke Jesus and rebuked him for not caring about them. Here the disciples saw both Jesus humanity and his deity. 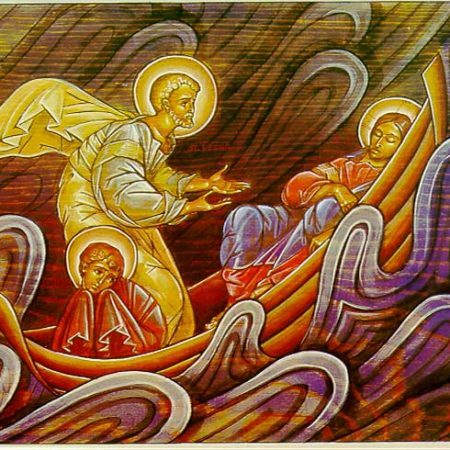 The symbolism behind the story of Jesus calming the storm should bring great encouragement to us all and gives us all great hope. The crises in life have often been compared to stormy seas. Storms will come, but we are never alone in the midst of our fear, our uncertainty or our suffering; when we persevere with Christ we can – we will – overcome! We just need to focus on Jesus – not the storms and battles of life. Jesus has power over the storms of life. He experiences them with us, loves us, saves us from them, and wants us to trust more than we do. The promises made to us in the life, death and resurrection of Jesus empower us to do great deeds. Our faith and trust in Jesus can make us unafraid of giants, gigantic tasks or the battles, struggles and other challenges of life. Storms don’t worry Jesus – he isn’t scared! The stories tonight remind us to focus on Jesus – not the battles or the storms of life. “Peace be still.” Nothing is too big or too rough for God.